Signed as a free agent on Sept. 11, 2018. 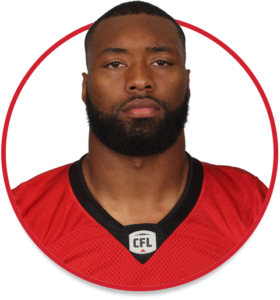 Casher attended training camp with the Winnipeg Blue Bombers in 2018 and was also briefly on the Blue Bombers’ practice roster in 2017, signing on Oct. 24 and being released on Nov. 2 at the conclusion of the regular season. Casher signed with the National Football League’s Oakland Raiders as undrafted free agent on May 9, 2017, and he was waived on Aug. 4, 2017. He signed with the New York Giants on Aug. 14, 2017. (Calgary) Casher attended training camp with Winnipeg before being released. He signed with Calgary on Sept. 11 and spent all but one week on the Stamps’ practice roster. He was on the one-game injury list for Week 21. (Winnipeg) Casher spent 10 days on the Blue Bombers’ practice roster and did not see any game action. Casher played his senior season at Faulkner in 2016 and recorded 60 tackles and 8.5 sacks in 10 games for the Eagles. Prior to transferring to Faulkner, he attended Florida State and was part of the Seminoles’ national championship team in 2013. Casher played a total of 35 games at Florida State and recorded 61 tackles – including nine tackles for loss – as well as three sacks, a forced fumble and a fumble recovery that he returned for a touchdown. Casher played high-school football at Faith Academy in Mobile, Ala., and recorded 50 tackles, 19 tackles for loss and 10 sacks during his junior season.